Junior English in friendly action for Worcester City against Brakes. Brakes boss Paul Holleran has hailed the capture of Junior English as a “big, big signing for the club”. English boasts a wealth of experience having spent 12 year at Moor Green and Solihull Moors where he made more than 300 appearances, playing in every position except goalkeeper and gaining promotion to the National League in 2016. The 31-year-old joined Worcester City last summer, scoring three times in 38 games as City were relegated from the Conference North, picking up the manager’s and players’ player of the year awards. The player is well known to Holleran, who fought off number of rival clubs to land the former Brackley loanee and he says English’s ability to play in a number of positions makes him a precious commodity. “I’m delighted to bring someone in of Junior’s experience and quality. He’s versatile and he’ll be a great asset for us on and off the pitch,” said Holleran. “He’s an all-round footballer, quite a unique talent. I’ve watched him at quite a few clubs and I couldn’t tell you what his best position is. “It’s why quite a few clubs wanted to sign him. 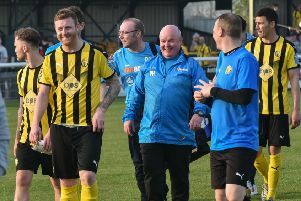 Speaking to Leamington’s official website, English said: “I am looking forward to a new challenge at Leamington, and playing for Paul Holleran, who I’ve heard a lot of good things about. “The league will be tough next season but I am more than confident we can hold our own with the players and management we have here.